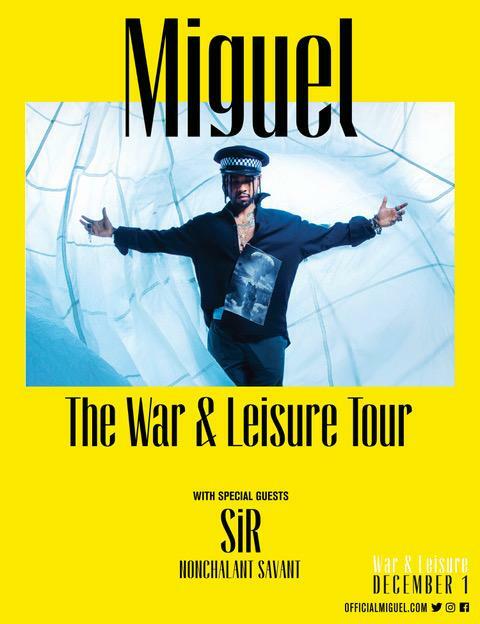 With less than a day until the release of his highly anticipated fourth studio album, Grammy Award-winning singer / songwriter Miguel has announced a North American tour in support of his upcoming album, War & Leisure. The 35 date THE WAR & LEISURE TOUR kicks off February 22nd in Portland, Oregon, hitting major markets in the US and Canada throughout the Spring and concluding on April 12th in Berkeley, CA. TDE’s SiR & NONCHALANT SAVANT will join Miguel on the road as opening acts for all North American dates. Tickets go on sale December 4th starting at 10AM local in select markets. VIP packages are available and can be ordered at officialmiguel.com and through Adventures in Wonderland. Every online pair of tickets purchased includes one physical or digital copy of War & Leisure. War & Leisure drops worldwide on December 1st. Pre-orders are now available here, and check out his tour dates below!